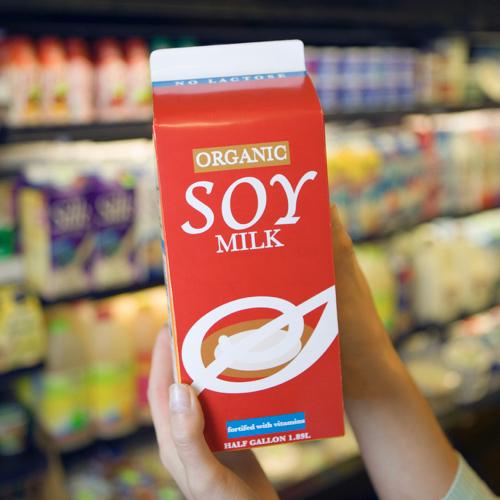 Soy milk and other soy products, including tofu, miso, tempeh, edamame, and the soybeans themselves, are high in such nutrients as fiber, iron, magnesium, potassium, protein, and zinc. Soybeans naturally contain a class of phytoestrogens called isoflavones. When we hear the word “estrogen” in the word “phytoestrogens,” we may assume that means soy has estrogen-like effects. Not necessarily. Estrogen has positive effects in some tissues and potentially negative effects in others. For example, high levels of estrogen can be good for the bones but can increase the likelihood of developing breast cancer. Ideally, we’d like what’s called a “selective estrogen receptor modulator” in our body that would have proestrogenic effects in some tissues and antiestrogenic effects in others, which is what soy phytoestrogens appear to be. Soy seems to lower breast cancer risk, an antiestrogenic effect, but can also help reduce menopausal hot-flash symptoms, a proestrogenic effect. What about soy and breast cancer? Women diagnosed with breast cancer who eat the most soy appear to live significantly longer and with a significantly lower risk of breast cancer recurrence than those who eat less. The quantity of phytoestrogens found in just one cup of soy milk may reduce the risk of breast cancer returning by 25 percent. The improvement in survival for those eating more soy foods was found both in women whose tumors were responsive to estrogen and those whose tumors were not, as well as both young women and older women. Soy consumption has also been shown to benefit our kidneys, which appear to handle plant protein very differently from animal protein. Within hours of eating meat, our kidneys rev up into hyperfiltration mode. But, an equivalent amount of plant protein causes virtually no noticeable stress on the kidneys. Image Credit: Jupiterimages / Thinkstock. This image has been modified.